Here’s another poem to celebrate National Poetry Month. This poem was written by David, a fourth grader from Ms. Fuenzalida’s class at J. J. Pickle Elementary. 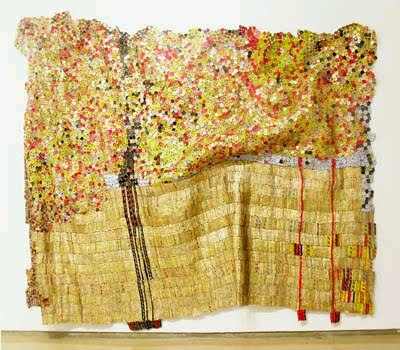 David was inspired by Digital River, a piece from El Anatsui’s exhibition at the Blanton Museum last fall. The foot of a dinosaur and the tail of a serpent can be seen in the place where flowers are planted. A boat, small enough for a rat, appears. Or a train, passes the rats in the place where small animals live and swim. It’s like a beach, full of sand, surrounding the water.